Home / Uncategories / Preserve Ozone! Preserve Lives! heard my mum say something about the ‘ozone layer’ being depleted. Through natural cycles the ozone is destroyed and repaired almost immediately but this time, the rate of its destruction is far beyond its repair thereby, creating lower-than-normal levels. 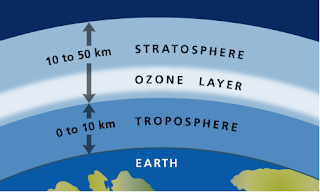 The ozone which is a colourless gas mainly found in the stratosphere (second layer of the atmosphere) is very reactive chemically and is beneficial at trapping radiations from the sun hence, protecting man and other living things from their harsh effects. The absorption of these radiations by the ozone layer helps to play an important role in the control of the earth’s temperature. These radiations are a mixture of electromagnetic waves such as infra-red rays, ultraviolet (UV) rays, visible light etcetera. UV–C is extremely harmful to all living things, UV-B is harmful to the skin as it can cause sunburn and skin cancer. It is also a risk factor for cataract and some genetic damage while UV-A is less harmful to the skin as it has no effect on DNA even though it is also a risk factor for skin cancer. The ozone layer absorbs the entire UV-C released from the sun but UV-B and UV-A is not completely absorbed by the ozone layer. However, at its longest wavelength some UV-B reaches the skin and aids in the production of vitamin D.
Over the years, it was observed that the fragile ozone layer was being depleted daily through the activities of man on earth. The use of chemicals such as solvents, propellants, halocarbon refrigerants and foam-blowing agents (e.g. chlorofluorocarbons, hydrochlorofluorocarbons, hydrobromofluorocarbons, freons and halons) by man depleted the ozone layer by releasing halogen atoms that break down the Ozone (O3) into oxygen (O2). This depletion created a deficiency in the ozone, reducing its ability to effectively trap ultraviolet rays from the sun thereby exposing all living things to very adverse conditions and the earth to climatic change. 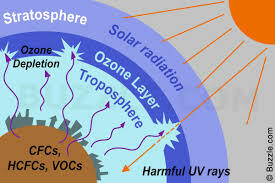 This resulted in the banning of the production of ozone-depleting substances through the Montreal Protocol on Substances that Deplete the Ozone Layer. In spite of this, the effect on the ozone remains as it will take several years to free the atmosphere from chlorofluorocarbons that have been released overtime. It is said that man’s activities may eventually destroy the world but we can take a good step in the right direction so as to prevent this saying. Health Information at its Peak! We bring you quality information that brings your hope alive and keeps your body rejuvenated.